Just as when you thought the search for a unique and branded bag is over, then comes this beautiful from Chanel. Ladies, the Chanel Click Label Shopping Bag. Undaunted by its precedents, the new Chanel Bag is all you could ever ask for. 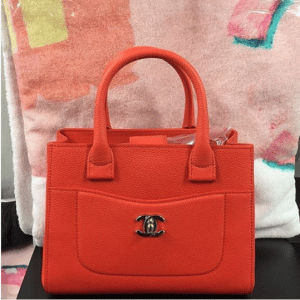 It features a metal plate with the Chanel logo in the center, which quite resembles the look of the Chanel Trendy CC Bag Metal Clasp. Made grained calfskin leather & gold metal hardware, this one is undoubtedly hard to beat. 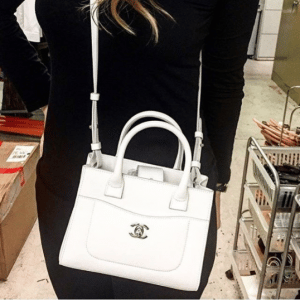 You see, every bag-obsessed lady search for feminine and timeless in fashion, the Chanel Click Label Bag definitely the dream bag. It’s as hot as the Chanel Trendy CC Bag, perhaps even hotter. The Chanel Click Label Bag is made in flat quilting, with beautiful smooth leather around the edges. Like we said, the center features a metal plate, the size is just right – not too big and not too small.